Recently Excels has invested heavily in patented Italian technology for the cleaning of natural skin wears. This is the first suede and leather processing plant of its kind in the UK and employs a totally new technology in cleaning natural skins. As a result it improves quality and reduces traditional adverse affects of cleaning suede and leathers such as running glues. Excels operates an order reminded services. Traditionally items are collected and returned to dry cleaning customers on pre-defined collection days. So, for example, if a Monday collection is missed, this can result in turnaround times of more than three weeks. 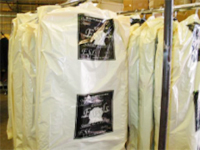 Excel's dry cleaning customers on the other hand can either request a traditional collection and delivery service or pre-book weekly collections. Furthermore customers can request our operator to phone and remind the customer. As a result, this is a more efficient and faster service where items can be collected faster and improve turnaround times for the dry cleaners and in turn their customers. Excels suede and leather offers a free collection and delivery to all customers. 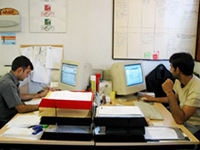 Excels operates a computerized tagging and tracking system where all collectables and deliverables are tagged and bar coded for tracking purposes. This ensures that customer's ad hoc queries regarding their collected items are answered promptly and accurately. Customers can phone and track the progress of their cleaning time anytime. Please download our terms and conditions here, read and sign and then contact our operator to book your items on; Tel: 020 8848 1008.